Remember how I told you less than two weeks ago that I only eat one of three things for breakfast on a regular basis? Well, I lied. I now have four! 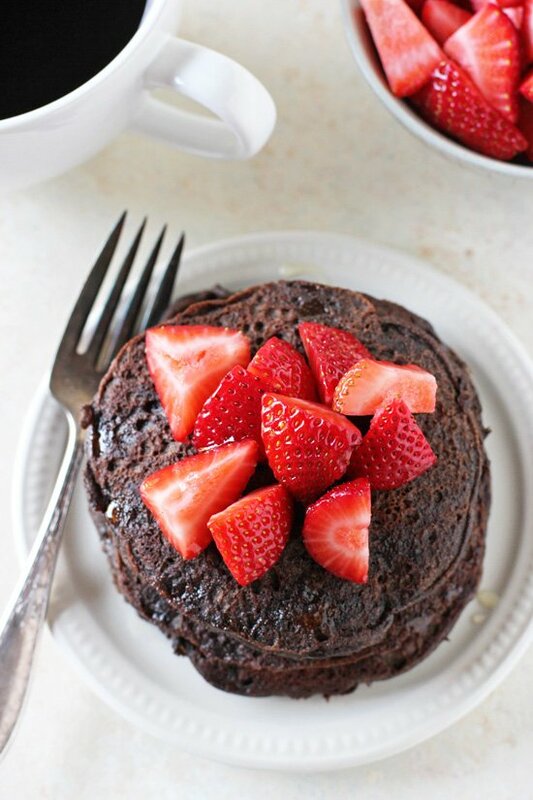 These chocolate buckwheat pancakes are the newest addition to the breakfast lineup. And quite the addition they are. I cannot stop making them. Obsessed might be the appropriate word here. Yes, definitely obsessed. Which is saying a lot, considering I am that person who typically refuses to make pancakes. Why you ask? Because I am literally the worst pancake flipper ever. Ever. We’re talking I destroy at least two pancakes every single time. It’s slightly horrifying just how bad I am at it. Someone come teach me your pancake flipping ways. Please, pretty please!? But enough about my horrible skills in the pancake flipping department (you don’t want to know how many tries it took to get three decent looking ones for these photos – oy vey). So tell me. Have you heard of buckwheat flour? Despite the name, it’s actually not related to wheat at all (and is instead made from the seed of a plant related to rhubarb!). It’s gluten free and lends this awesome dark color and unique nutty taste to dishes. Not to mention that it’s quite good for you. It’s an excellent source of fiber, protein and calcium, among others. As for today’s recipe? The base of these pancakes is a combo of both buckwheat flour and unsweetened cocoa powder. The combo of the two is just pure magic (in my opinion!) and results in light, chocolate-y, fantastic pancakes that pack a nutritional punch. That’s a breakfast win! Like always, let’s chat a few tips & tricks for these pancakes! The base of these pancakes is only mildly sweet. This way you can drizzle on however much maple syrup or honey you like as a topping. And when combined with those fresh strawberries? Gah, so good. Chocolate + strawberry = perfection. <— That’s a fact! Another serving suggestion? Try smearing on a good dollop of sunflower seed butter (other latest obsession) or almond butter, a light drizzle of honey and then the strawberries. The combo is out of this world. Be sure to melt the coconut oil first, then measure out the correct amount. Otherwise you may use too much. While pancakes are definitely best freshly made, I’ve been doing the following so I can enjoy these throughout the workweek as well. Make the pancakes as directed, then allow to cool to room temperature. Wrap individually (or two together) in plastic wrap and store in the fridge. In the morning, just pop into the microwave for about 15 to 20 seconds to warm, and then top as desired (remove the plastic wrap before heating!). The amount that I look forward to breakfast when I do this is slightly ridiculous. So can you tell how much I totally heart these?? I’m going to stop now. Let that delicious looking bite do all the rest of the talking for today. 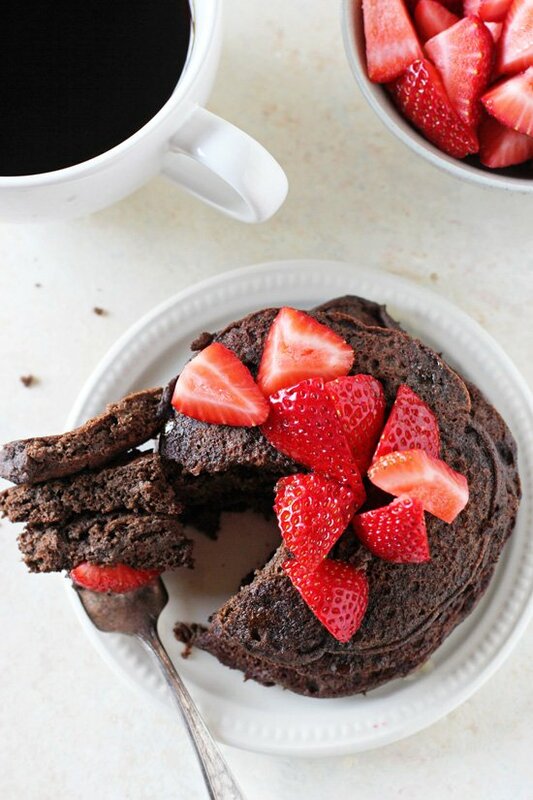 Light, fluffy and nutritious chocolate buckwheat pancakes! Top with fresh strawberries for a perfect pairing! Dairy free & gluten free! In a large bowl, whisk together the buckwheat flour, cocoa powder, baking powder, baking soda and salt until well combined. In a medium bowl, whisk together the egg, almond milk, coconut oil, vanilla extract, almond extract and honey until well combined. Add the wet ingredients to the bowl with the dry ingredients and mix until just combined (the batter will be a little lumpy). Set a large nonstick skillet (or a griddle) over medium / medium low heat. Once heated, spray with olive oil or another nonstick spray. Give the batter a quick stir, then scoop / pour about ¼ cup for each pancake into the skillet (as many as you can comfortably fit). Cook for about 2 to 3 minutes, until small bubbles start to form on the surface (and the edges are starting to look set). Flip the pancakes and continue to cook for another about 1 minute, until golden brown and set. Serve the pancakes topped with a drizzle of maple syrup (or honey!) and plenty of fresh strawberries!